A Review by David L. Vineyard: EUG�NE SUE – The Mysteries of Paris. EUG�NE SUE – The Mysteries of Paris. W. Dugdale, UK, hardcover, 1844. Harper & Brothers, US, 1843. Translation of Les Myst�res de Paris: Paris, 1843-4. Silent film: Esclair, 1909 (scw & dir: Victorin Jasset). Also: SCAGL, 1913. Also: Cinematographes Phocea, 1922, as Les Myst�res de Paris (scw: Charles Burguet, Andre Paul Antoine; dir: Burguet). Also: Bennett, 1922, as The Secrets of Paris (scw: Dorothy Farnum; dir; Kenneth Webb). Sound film: Franco-American, 1937, as Les Myst�res de Paris (The Mysteries of Paris) (scw & dir: Felix Ganders). Also: Unidex, 1962, as Les Myst�res de Paris (The Mysteries of Paris) (scw: Jean Halain, Pierre Foucault, Diego Fabbri; dir: Andre Hunebelle). Despite its title, Mysteries of Paris is neither a mystery nor a detective story in any formal sense, it is however an early example of the crime novel and thriller and helped to establish many of the tropes of popular fiction that still linger today. Heroes from Zorro to the Shadow to Batman owe a debt to Sue’s Prince Rodolphe (in some editions Rudolph), the mysterious man in black haunting the back alleys of crime and poverty ridden Paris. Eug�ne Sue was a minor nobleman with a political bent. He was an avid socialist and critic of the Catholic Church — particularly the Jesuits who feature as the villains of his classic The Wandering Jew. He spent much of his career in semi-exile for his criticisms of Louis Napoleon, like his friend and fellow author Hugo. Sue also has an ironic role in history: In one volume of his massive Mysteries of the People, Sue created a fictional document detailing how a Jesuit conspiracy operated and secretly ran the world — when this ‘document’ was plagiarized by a Russian propagandist and the references to the Jesuits changed to Jews the document became the inflammatory and wholly fictional Protocols of Zion; an irony that would have horrified the liberal Sue. But Sue’s role in popular literature is secure with his two best known works, The Wandering Jew and Mysteries of Paris, the latter followed by countless imitations, with Mysteries of London, Prague, Berlin, and even New York to follow. Its influence extended well into the early 20th Century (fans of the TV series Friends might recall the “Mysteries of New York” poster on the wall in Joey and Chandler’s apartment). Prince Rodolphe of Gerolstein appears in Paris as a mysterious man in black. He is on the trail of Fleur de Mal, a child orphaned by an act of carelessness in his youth. 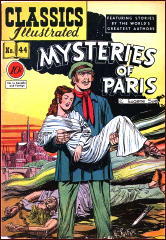 As he searches the lowest and vilest of Paris slums he becomes an early model for the justice figure or avenger, seeking both redemption for himself and justice and mercy for the downtrodden but good people he finds driven to crime and degradation by poverty and social injustice, befriending and reforming many of the criminals and semi-criminals he encounters and even forming a sort of ‘thieves court’ with himself as judge which deals out fair but swift justice among a people who have no trust of the corrupt real courts and laws written and administered to oppress them. Sue threw himself into the novel with real zeal, and his use of Parisian street argot is a remarkable accomplishment. Any historian wishing to know what life was like in the streets of mid-19th Century Paris would be advised to carefully read Sue’s novel. Like Dickens to whom he was often compared, he had a real affection for the people of the streets of Paris though a realistic eye for detail. In some ways Sue’s modern disciples are writers like W.R. Burnett, Elmore Leonard, Joseph Wambaugh, and George V. Higgins. There is, as might be expected, a good deal of melodrama, pathos, bathos, and hokum in the novel. Its serial origins show, and at some 1300 pages in unabridged editions, it is far from a casual read. It gives the term Victorian triple-decker new meaning. 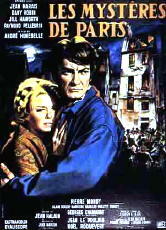 Mysteries of Paris has been filmed and adapted to other media countless times since the silent era in many languages. There are television mini-series and even animated versions, and it was one of the early books adapted by Gilberton’s Classics Illustrated Comics. Perhaps the best film is a 1962 Arthur Hunebele production with Jean Marais (Orphee, La Belle et la Bete) as Roldolphe, Dany Robin as Irene, and Jill Haworth as Fleur de Mal. By necessity it is a very abridged version of the story, but told in a lively manner by a director best remembered for his campy Fantomas films with Marais in a double role as the super criminal and his nemesis Juve. Mysteries is still widely read in Europe and considered a pop classic. It is less well-known here, in part because there has never been a really good translation of the novel nor an annotated edition, both of which are long overdue. But Mysteries is an important book in the development of the mystery genre, taking inspiration from Poe, Dickens, Collins and others, and in turn inspiring many of the works to come. Currently there are several editions available and some older reprints are relatively inexpensive to collect. I would suggest you avoid the abridged editions and go for the massive entire book. You might also want to read The Wandering Jew which was recently chosen by Thomas Disch for the 100 Best Horror Novels of all time. Sue really is neglected in this country and unjustly so. This is a novel that deserves to be rediscovered. I admire your dedication for reading/getting through this, and envy your ability to put it across so quickly and readably. Maybe I’ll even get around to it one day…. It’s not that difficult a read in the sense that it is full of incident and action. Of course like most serial novels there are countless subplots and you may need to keep a legal pad nearby to keep track of characters names. There is a good deal of horror, suspense, and terror in it, but in all honesty a good deal of melodrama and pathos. The Wandering Jew is an even better novel, but both have their full share of the worst of 19th Century serial fiction. Still, if you try and like it check out Sue’s contemporary Paul Feval’s pere’s John Devil, and his Les Habits Noir novels being reprinted by Black Coats Press — they are not only historically important, but also thumping good reads. Readers of this blog might be particularly interested in Paul Feval pere’s John Devil (Jean Diable) available from Black Coats Press. It’s the story of a super criminal in London who plots to free Napoleon from his island prison and conquer British India with a fleet of steam powered ships. He is opposed by Gregory Temple of Scotland Yard, one of the first Scotland Yard men in fiction, if not the first (Feval mistakenly has the Yard operating in Napoleonic times, but still it is historically important). This translation is by noted British writer Brian Stableford and has an informative intro and afterward. Again this is not a detective story or mystery formally. It suffers and enjoys many of the flaws and much of the fun of a serial novel of its age. Feval is also the creator of Les Habits Noirs, an eleven volume saga of a society of super criminals that is sort of an early Godfather. His place in the detective story is assured because his secretary was Emile Gaboriau, who named his sleuth Lecoq after one of the members of Les Habits Noir. Do you have editions/translations that you recommend of “Mysteries” and “Wandering Jew”? I’m interested in reading both, but don’t know which translations to read. I see there is a Modern Library edition, now out of print, of “Wandering Jew,” which is available from ABE Books. In Jack Kerouac’s “On The Road”, one of his characters, Roy Johnson (who was only briefly in the novel) was said to be “…waiting in the car, reading Eugene Sue’s “Mysteries of Paris”(p.195). I have now looked up Eugene Sue to verify his existence. Oh well. Hello. 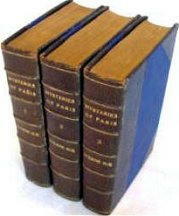 Do you know who was the translator of “The Mysteries of Paris” in the Dugdale edition? Thank you for your help. I found your review while searching for something to describe this book to a friend. I’m thoroughly enjoying it – I’m on page 1132 of the old “complete in one volume” copy I found recently. I’m so happy I stuck with it after the first few pages that were a bit difficult, until the story grabbed me and I now eagerly look forward to the time when I can sit down with it, usually before bed. It’s a wonderful good read!!!!! Since my copy has no copyright date or date of publication, I really appreciate your very informative review. One important fact that has been overlooked by all. That is, ‘Mysteries of Paris’ was a favourite read of:Carl Marx (and his daughter E. Marx. as we all know, adopted by Lenin, Stalin, etc. causing human disaster (millions lost their lives). influence to the mankind. Sad but all true. B.N. I came across your article as I was looking for info on Eugène Sue. I am writing my dissertation on “The Mysteries of Rio”, by Benjamim Costallat (1924). Your information is most helpful.